Frame #1: The hands have just entered the water at full stretch and shoulder width apart. The shoulders are elevated to produce a long reach forward. The hips have dropped from streamline as they follow the knees to facilitate a very large kick that is to counter-balance the vertical force component of the entry. Frame #2: The hands perform a brief outward scull to stop the shoulders sinking. This is necessary because stopping the arms at the entry transfers their momentum to the shoulders. As well, the very powerful kick forces the hips up which will also force the shoulders down. Frame #3: An exaggerated hip rise that results from the big kick is clearly visible. The shoulders are pushed down partly as a reaction while the hands stay up near the surface. The double-curve posture of the swimmer, low feet and shoulders, high hands and hips, could be faulted. Some individuals would argue that this constitutes a "wave" action. However, such movements are not propulsive if the speed of the water travelling down the body as a result of the wave is not accelerated. The movement of the shoulders would reduce the likelihood of this occurring, particularly since the shoulders and hips move through a similar distance. The head is partly raised and looking slightly forward. Frame #4: The upper arms are spread quite wide. In contrast to Dennis Pankratov, the exaggerated forces on the shoulders require a longer duration sculling action to halt their descent. The upper arms are slightly medially rotated and the elbows are bending. The head is slightly forward and probably assists in returning the shoulders to the surface where a streamlined torso position could be attained. Frame #5: The shoulders rise as the arms move to an "elbows-up" position to produce a propelling surface that combines the hands and forearms. The body posture has been corrected to a flat streamlined alignment. The head looks down to the bottom. Frame #6: The upper arms are adducted which produces a very powerful action as both hands and forearms drive backward. The legs prepare to kick at a very early stage in the stroke. Frame #7: The arms are still pushing but rather than against the water with the body and legs fully streamlined, the hips and knees have dropped, causing considerable resistance. That movement will detract from propulsive effectiveness. The head remains just under the surface looking to the bottom. Frame #8: The arms are rounded-out and begin to be extracted from the water. The upper arms have already broken the surface. The legs kick to counter-balance the vertical action of the arms. The hips rise slightly from the position in the previous frame. Frame #9: The large vigorous kick has caused the body to be locked straight for a brief period. Unfortunately, the alignment is not horizontal but angled slightly downward. Frame #10: As the arms sweep out and over the water, the hips are forced down as a result of the vertical force component involved in the recovery. Frame #11: Once the arms pass the mid-recovery "sticking point," the knees bend to prepare for a kick to counter-balance the entry of the arms. The absence of streamlining is notable. Frame #12: As the hands approach the entry the legs start to kick but with the hips lower than the shoulders. Frame #13: As the kick is made in time with the hand entries, the hips rise. Susan O'Neill is Olympic Champion in an event that has the oldest standing world record. While men's butterfly world records have been steadily improving, the women's have rarely looked like being challenged. Could this difference be because the women have failed to improve technique to a similar extent than the men? It is always a temptation to compare two or more swimmers. It is not known whether men and women swim this stroke with similar capacities, which, in turn, would warrant similar techniques. However, there are marked differences between Susan O'Neill and Denis Pankratov, disregarding Pankratov's side-breathing. Firstly, Susan O'Neill does not exhibit many stages in her stroke where desirable streamlining is demonstrated. From frame #7 to #13 her hips remain lower than her shoulders. This is a position that could be improved if one wanted to increase streamlining in order to decrease resistance. Secondly, Susan O'Neill's kick appears to be associated with exaggerated reactions in other parts of her body. Those movements would also increase resistance, particularly wave resistance. Thirdly, the "wave" movements along the swimmer's body do not appear to be the type that would accelerate the velocity of water down her body. That acceleration only occurs in the legs when extension of the legs occurs. Thus, the wave/undulation is not propulsive but would increase wave resistance. 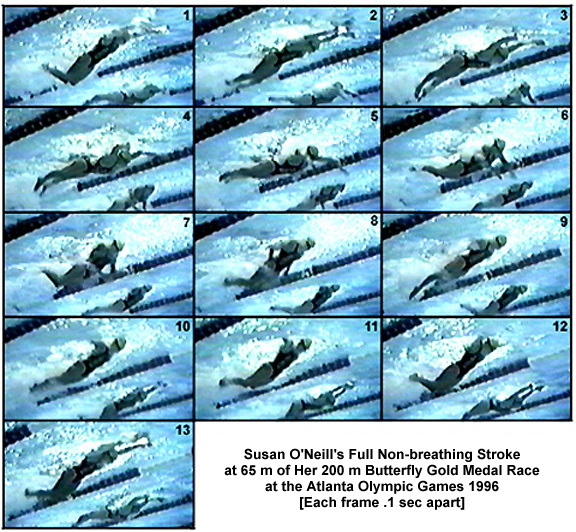 Despite these theoretical critiques, Susan O'Neill is a great swimmer of this stroke.